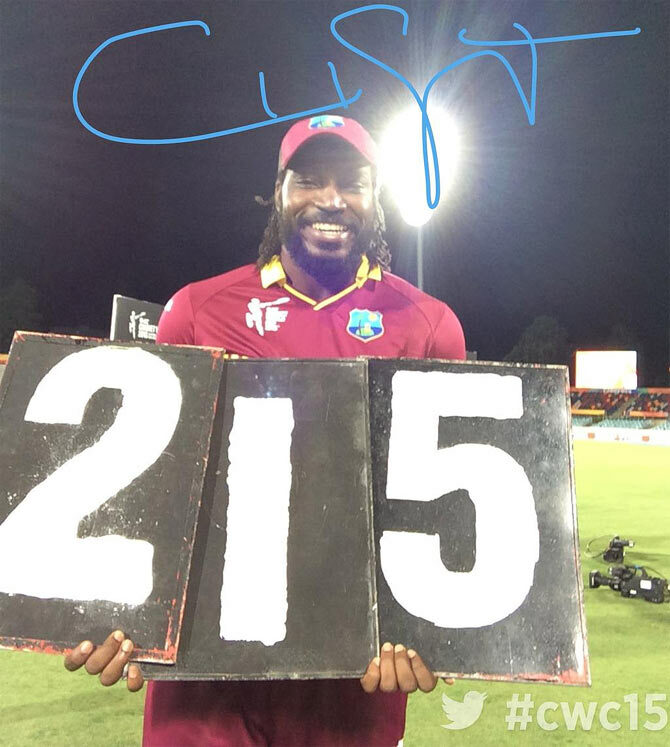 Chris Gayle signs an autograph for the camera after his record-breaking double century at the Manuka Oval, in Canberra, on Tuesday. England lose their match against Sri Lanka and are now just above Scotland at the bottom of the points table. With two matches to go for them, one against Afghanistan and the other Bangladesh, they could just about make it to the quarters. New Zealand and Sri Lanka are into the quarters and Australia is quite likely to enter quarters too. The fourth slot is up for grabs between Afghanistan, England and Bangladesh. Poor leadership and lackluster performance. They could have at least made it to quarters, but I guess the better team won (Bangladesh). Pool A: New Zealand, Australia, Bangladesh and Sri Lanka are through to the Quarters. Pool B: India looks to have qualified. OK. We enter the Semi Final matches tomorrow. Zimbabwe and Ireland played some good cricket. For Afghanistan, this was their first World Cup outing. Pakistan played some really good cricket and might have pulled off an upset in the QFs, beating Australia. I'll be watching the second semi-final match like those frightened Roman soldiers in Asterix comics. I know one should report un-biasedly, but am really really upset at South Africa's loss to NZ today. Both teams played excellent cricket. One is almost tempted to say it is the 'hand of fate', but I guess it was just the play of weather, first the rain and then the dew factor. Well played AB and team. You guys played your heart out. Well played McCullum. You were smashing. It will be a history day ! Most of the country will be on leave I guess. I just read AB's interview to the press. I 'crid'. So 'sed' really. Edit: Tomorrow will be a 'pre-historic' day. 29th (Finals) will be the historic day. "You'll see" (singing Madge's song).